One example of this is the theory's prediction that demand for products not available in traditional bricks and mortar stores is potentially as big as for those that are. But the same is true for video not available on broadcast TV on any given day, and songs not played on radio. In other words, the potential aggregate size of the many small markets in goods that don't individually sell well enough for traditional retail and broadcast distribution may rival that of the existing large market in goods that do cross that economic bar. 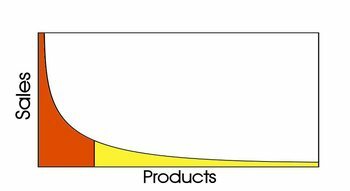 The term refers specifically to the yellow part of the sales chart above, which shows a standard demand curve that could apply to any industry, from entertainment to hard goods. The red part of the curve is the hits, which have dominated our markets and culture for most of the last century. The yellow part is the non-hits, or niches, which is where the new growth is coming from now and in the future. What's the size of the Long Tail (defined as inventory typically not available offline? How does the availability of so many niche products change the shape of demand? Does it shift it away from hits? What tools and techniques drive that shift, and which are most effective? The Long Tail article (and the forthcoming book) is about the big-picture consequence of this: how our economy and culture is shifting from mass markets to million of niches. It chronicles the effect of the technologies that have made it easier for consumers to find and buy niche products, thanks to the "infinite shelf-space effect"--the new distribution mechanisms, from digital downloading to peer-to-peer markets, that break through the bottlenecks of broadcast and traditional bricks and mortar retail. The economics of niche product areas can be particularly attractive if the problem of short-run production and distribution are resolved. Consumers will place a premium on the product that most closely meets their unique mix of needs, and will pay accordingly. Whilst 'mainstream' products can become commoditised very quickly, reducing profit margins and politicisng production and distribution, the niche product can maintain higher margins throughout its lifetime. Mass customisation techniques in manufacturing, communication, and consumer relationship management, can provide both the economy of scale needed to reduce production and distribution costs whilst at the same time more readily identifying and addressing the needs of the individual. Seems like fertile soil for research and discussion. profound long-tailness of international cuisine? My only addition would be to suggest you call the industrial age solutions "one size fits most." Far too many needs and desires are left out by bureaucratic decision makers to call it "one size fits all." Not all reasonable needs of the technologically empowered are met by the emerging Netcohort Society, at least not yet. As understanding of your long tale model grows so will society's individually tailored implementations based on it. I found this article "The long tail in short". I think is a reblog form HBR Article but its better o give credit to a blog than HRB. Just started reading your groundbreaking work(I am on chapter 4, so i could be overshooting with this idea i am just going to put forth. The proposition would apply only if its contents haven't been considered in your book so far.) Have you considered your 'Long Tail' theory being applicable to a scenario other than business? Pointedly i wanted to mention about my religion which is 'Hinduism'. We don't have one single God that we pray to or worship. Rather we have millions of God whose influence range from a very localized following & belief, to almost a global one. Going through your book & watching a series on India on Nat Geo just made me jump out of my couch & i was sheerly compelled to put this note to you. Somehow, your books seemed to resound my own ideology which has had a significant influence from the Indian cultural & religious thought process. And, the key word that i found echoed most & shared between these religious teachings & ideas propounded by you is of a 'culture of abundance', where in each one aspires & propagates his efforts to nurture his individuality the most because there in lies the destiny of the highest order. And he is promised a world order of abundance in response to his yearnings (if they are pure in purpose & pursuit). In short i believe India has long been a cradle of 'Long Tail' in one of the most important aspect of life that is a person's 'religious & spiritual' beliefs. Hope you find this observation of interest to you. Can you explain me the graphic ? I don't understand it.